Email scheduling lets you set when your emails will be sent and spreads them across a period of hours, days or weeks. This means your contacts receive your messages at the optimum time and acts on them. 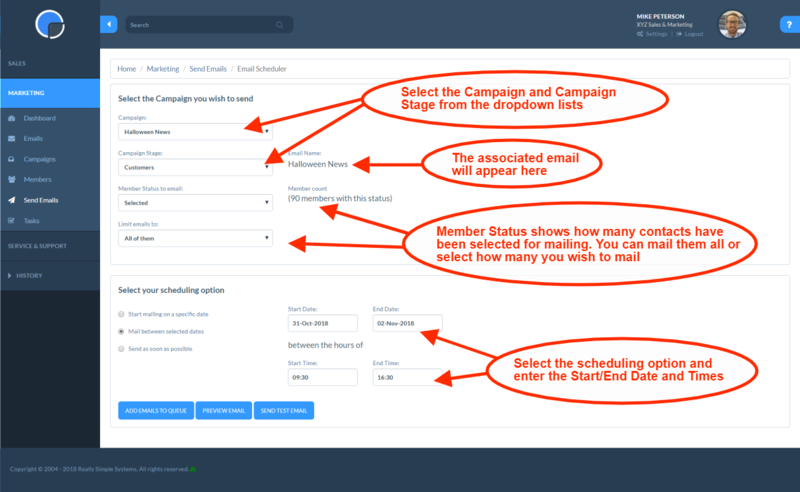 Once you have created your email and marketing campaign, in the CRM Marketing menu, click on Send Emails onthe main menu and then open the Email Scheduler. In the Campaign box find your Email Campaign from the dropdown list. The system will default to the last Campaign you created. Then, in the Campaign Stage box, find the Campaign Stage you wish to send from the dropdown list. The system will display the name of the email that has been set for that Campaign Stage. Using the ‘Member Status to Email’, select the Status of the Members you wish this email to go to. If this is your first email to the selected Members the status will be ‘Selected’ but on future emails in the same campaign you might, for example, only want to send to those with a status of ‘Clickthrough’, i.e. those who clicked on the links in your message. The ‘Email Name’ box will default to the email you have added to the Campaign Stage selected. You can then choose if you want to mail all the Members in that Campaign Stage, or limit the number. This is a useful feature if you are looking to test your messages. You can Preview the email or send yourself a Test Email to see exactly what your contact will receive. Start mailing on a specific date: Set the date and time you wish the email to start sending. Click in the date box to display the date/time picker. Send as soon as possible: Sends the emails as soon as possible. It’s best practice to only use this option when sending a small number of emails. In the Mailer Queue Monitor you can pause pause the Mail Queue page by clicking the red ‘Pause Mailer Queue’ button. If you pause the Mailer then no further emails will be sent until you start the Mailer again.